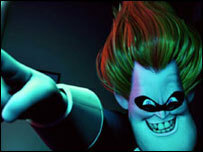 Syndrome - The Incredibles. . Wallpaper and background images in the डिज़्नी के खलनायक club tagged: disney villain villains pixar syndrome buddy the incredibles. डिज़्नी Villains - "Monster Mash"